A spectacular Kaga school armor. Deriving their wealth from the fertile plains of western Japan, the Kaga samurai developed a unique style that was both sumptuous and highly creative. The breastplate is adorned with a phoenix in silver splashed applied metal hovering over the crashing waves that festoon the thigh guards. 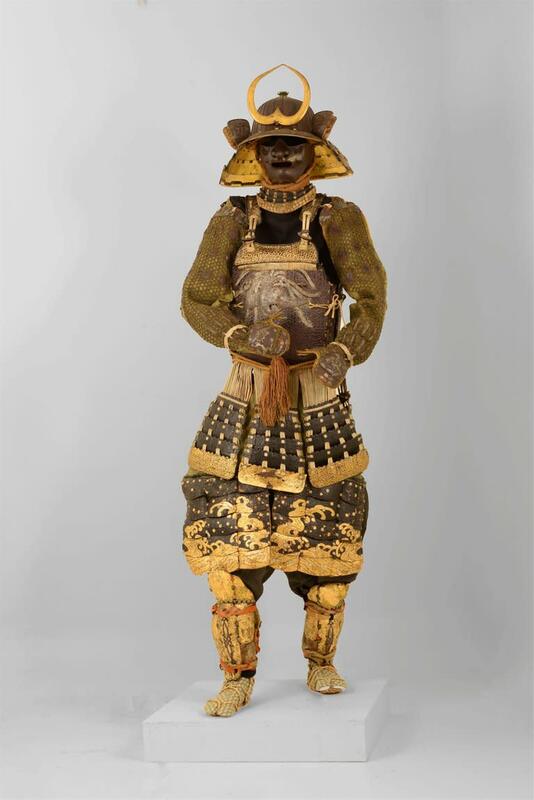 Decorated with clouds and bonji (sanskrit characters), the armor is splashed with silver beads in the sawari technique. Silver clouds swirl over the visor and back of the armor, while the buddhist wheel of the law adorns the gauntlets. Adult life size. Can be mounted standing or sitting.